How much do you know about the early Dutch settlers in the American Midwest, some of whom are your ancestors? Have you ever wondered how those early Dutch immigrants managed to create homes, stay healthy, educate their children, celebrate their religion, farm the land, and create a prosperous life in the primitive, unsettled prairie lands of Nebraska? Fortunately, in 1938 Mr. Gustav Adolph Bade wrote a thesis called, “A History of the Dutch Settlement in Lancaster County, Nebraska”, which answers many of those questions. 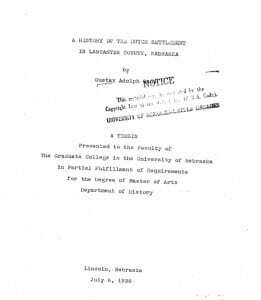 Mr. Bade’s thesis was presented to the Faculty of the Graduate College in the University of Nebraska on July 6, 1938, in partial fulfillment of requirements for the degree of Master of Arts, Department of History. This comprehensive document begins in 1856, when the first “white man” took up residence in Lancaster County, in the southeastern corner of Nebraska. By the 1860’s, there was a steady flow of settlers, including three te Selle brothers–Jan Hendrik, Gerrit Jan, and Harmen Jan te Selle, who had immigrated to the United States from Winterswijk, Netherlands, along with many other Dutch families. The Bade thesis helps you imagine how your ancestors and their Dutch friends managed to create a new life for themselves in the primitive prairie lands of the new Nebraska territory. We know you would find this thesis quite fascinating, and we wish we could reproduce it for you in its entirety. However, because of copyright protection, we can only present various excerpts from the thesis at appropriate places throughout this website. If you are interested in reading the complete Bade thesis, it is available commercially from Family Threads Genealogy, a firm owned by Kenneth Zimmerman and Elaine Obbink Zimmerman. Elaine Zimmerman’s family immigrated from the Netherlands to America in 1867. Mr. Derk Jan Englebart Obbink was a pioneer to Holland, Lancaster County, Nebraska. As of 2001, the Obbink family was still farming in Lancaster County, Nebraska.